Helix is well-known for their ability to customize your mattress, so it’s no surprise that their pillows can be personalized as well. Customers can add/remove components of the pillow until it meets their desired firmness and loft. The brand offers both the Helix pillow and the Helix Cool – they’re both very similar in design but feature different cover material. To find out if either Helix pillow is right for you, read on for my full review. Helix says the Standard size pillow works best with a Twin, Twin XL, Full or Queen size mattress. The King size will work perfectly with your King or CA King model. The Helix pillow and Helix Cool pillow feature a special “pillows-in-a-pillow” design. The filling in each section (on both pillows) is a blend of cross-cut memory foam and down alternative material. 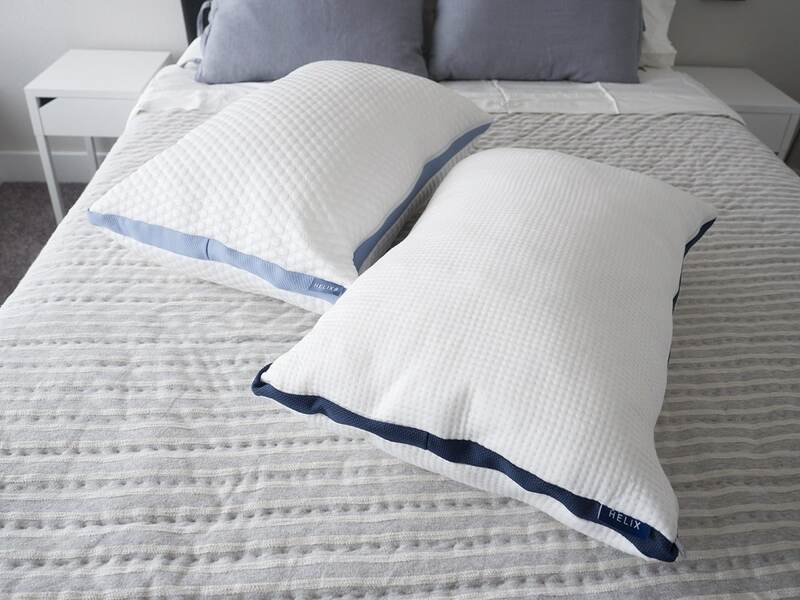 The outer cover of the basic Helix pillow is made of a high-grade polyester. The Helix Cool outer cover is made of a high-end ultra cool knit polyethylene fabric. With each pillow, you can open the Outer Comfort Shell via a zipper and access the two 1-lb memory foam/down alternative inserts. Each insert itself feels very light and sort of sparse. The idea is to combine them as you like for the perfect loft and firmness for you and your sleep position(s). I will say that the “pillow-in-a-pillow” design reminds me a little bit of the Casper pillow. 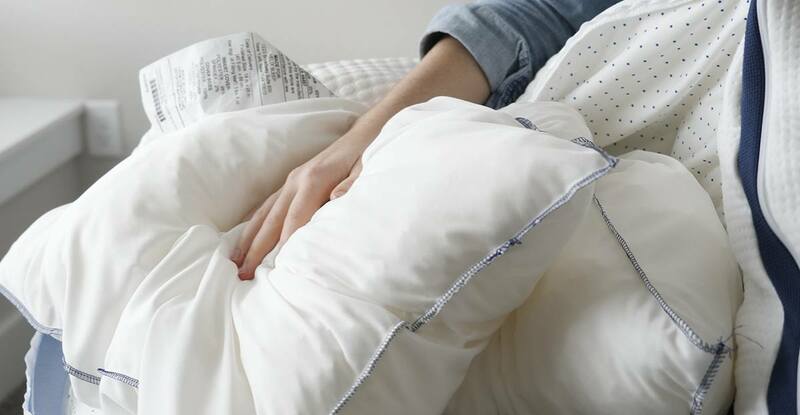 While Helix has two inserts, Casper’s pillow has one insert and is made with all synthetic polyester fiber filling. The Helix pillow and its cooling counterpart the Helix Cool are made by online mattress retailer, Helix Sleep. Helix Sleep is known for making personalized mattresses. They will design an ideal mattress for you based off of the answers to a Sleep Quiz and other information about you. Unfortunately, the Helix Pillow is not machine washable. We recommend spot cleaning as necessary with lukewarm water. Your Helix Pillow can be placed in the dryer on low heat every 6 months for maximum fluff, performance, and comfort. There are different ways to utilize the Helix pillow. 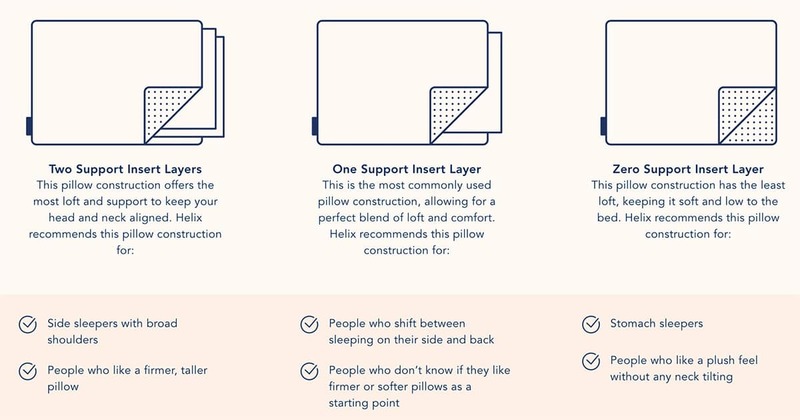 It’s all about picking how many – if any – support inserts you’d like inside the Outer Comfort Shell of the pillow. 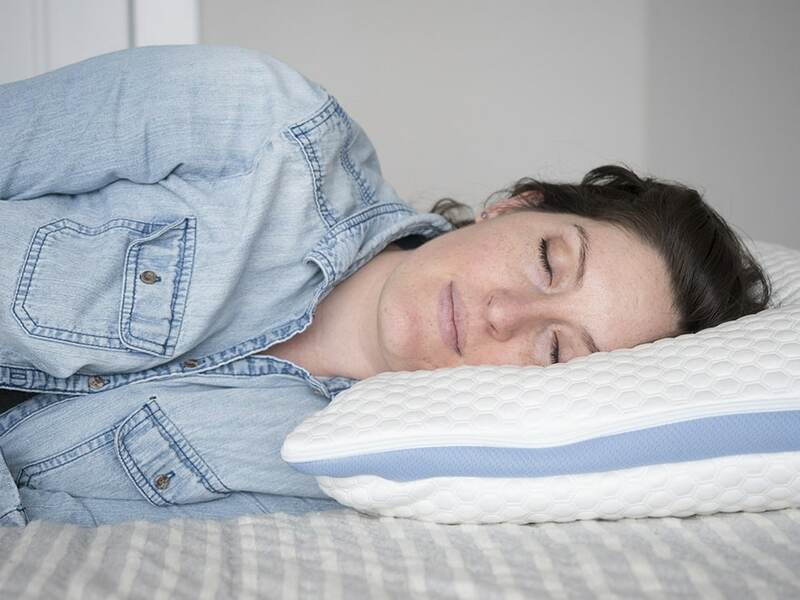 The Helix pillow – and its cooler counterpart the Helix Cool – really set themselves up to work for just about any sleep type or body type because of the two pillow inserts that you can remove. It makes it simple to determine the loft and overall firmness/feel of the pillow based on your personal preferences. Helix also has a handy guide on their website that helps you decide which Outer Shell/Support Insert combo might be the best for you. I primarily sleep on my side these days, but since I don’t have broader shoulders and sometimes end up on my back or stomach, I opted for the Outer Shell + one support insert option. After looking at the photos, I think maybe just using the Outer Comfort Shell (no inserts) would actually be best for my neck and spine as it seems to provide the most natural alignment. One thing you’ll notice about the support inserts is that they’re not overfilled. In fact, they’re not really filled much at all. Since you get two inserts, you’re actually able to make smaller but noticeable increases/decreases in firmness and loft this way. The pillow is a mix of memory foam and down alternative, so it has a slightly chunky feel but I would say that feeling is muted thanks to the fibers from the down alternative. I do wish that I could throw the whole thing in the washing machine, but you can spot clean it and toss it in the dryer for less than 10 minutes if you feel it needs to be fluffed up (or if it’s off-gassing too much for you). 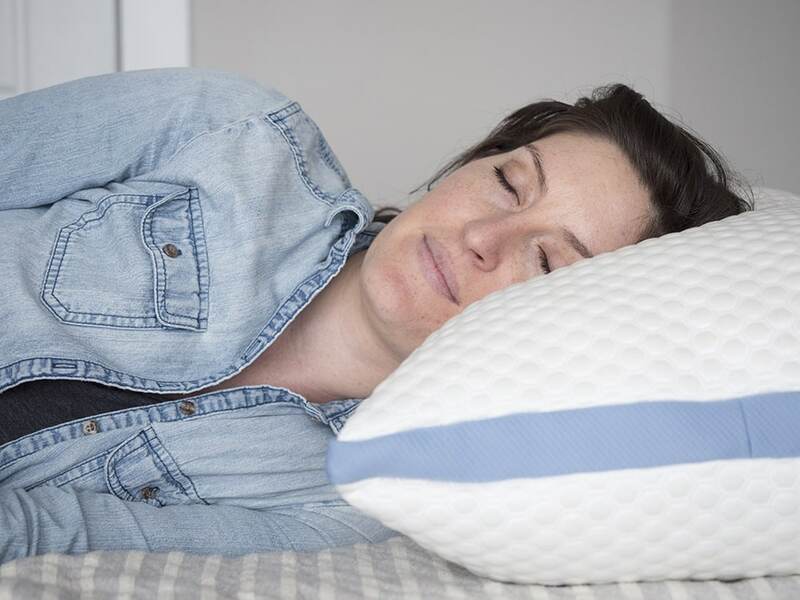 To check out our picks for Best Memory Foam pillows, click here. This is one of those pillows that have a little bit of everything – so really I do think it could work for the majority of people. It gives you the support from memory foam with the cozier feeling from the down alternative. And you can add/remove sections without worrying about messy pieces coming out. 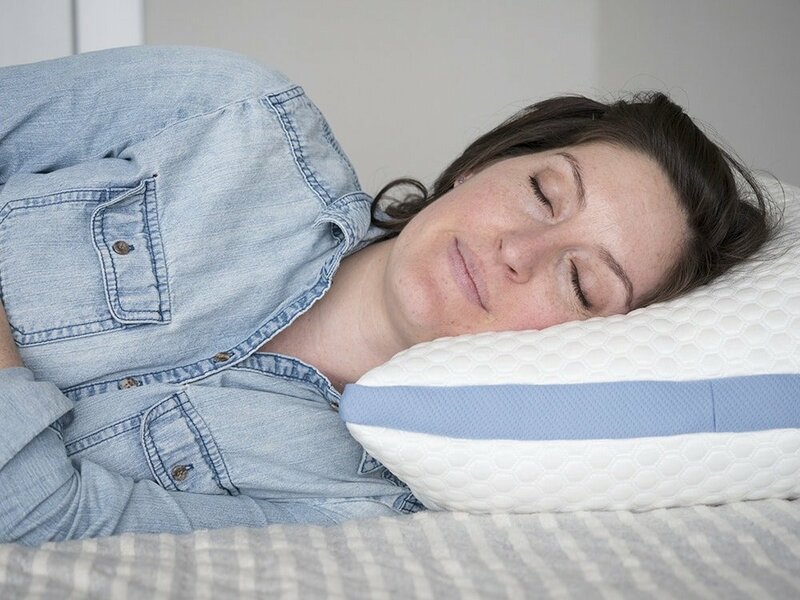 Give yourself 12-24 hours to let the pillow initially expand and then experiment with the write Outer Shell/Support Insert combo that is right for you. If you just can’t get on board with it, you’ve got 100-nights to send it back. How do you purchase a standard Helix pillow? Did you use the one with the cooling exterior? How was that? I’m considering that one because I sleep very warm so I’d be interested in your feedback.